New Year’s resolution to lose weight? Read this first. Holiday parties went straight to your hips? Looking to jump-start your New Year’s weight loss? Before reaching for any pill, powder, patch, exercise belt, or cream – know this: a lot of products promising quick, easy and permanent weight loss are bogus. They can hurt your wallet, and hurt your health too. Ready for another gut check? Experts agree that the only sure way to lose weight is by changing the way you eat, and exercising more. Lucky for you, the FTC offers great health and fitness tips for a smart start on getting slim and trim – from joining a gym, to guidance on buying new exercise equipment, and even an audio tip on diet ads and weight-loss products. Interested in learning how to tell fact from fiction when it comes to weight-loss products? 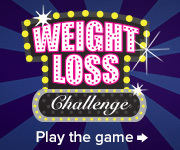 Take our fun Weight Loss Challenge game! And finally, if you are looking for general ideas about healthy eating, visit Nutrition.gov, ChooseMyPlate.gov, and the Weight-control Information Network. Great article! Here are some more tips. All foods can cause fat creation, but certain foods actually help burn fat. Some foods have minerals or vitamins that raise metabolism and act as virtual fat burners. There are negative calorie foods with low calories that burn extra calories during digestion. Other foods, even eaten in small quantities, deliver a feeling of fullness with very little calories. Sticking to the right whole foods will drastically reduce the fat profile of your body. Eating the right food will kick your metabolism into high gear and help you burn unwanted fat. Combine fat burning foods with these fat boosters to push your metabolism into overdrive. Drinking more water helps the body reduce fat deposits. The kidneys do not function correctly without enough water intake. If they don’t work properly, some of the load is discarder to the liver. If the liver is doing the kidney’s work, it can’t concentrate on its’ main job of metabolizing fat. More fat will remain in the body and fat burning stops. So drink the right amount of water improves metabolism and keeps your fat burning at full capacity. Water also flushes out toxins and improves the body’s ability to stay healthy. Muscle keeps you metabolism active and burning calories. Adding muscle improves your body fat composition ratio. Muscles are an active tissue that continually renews itself so it always needs calories. While normal cardio burns fat only during the exercise, weight training builds muscle ensuring body fat continues to burn throughout the day. The main source of energy for muscles is fat. So, even when relaxing or sleeping, you continue to burn calories. The more muscle mass on your frame the more positive effect on your metabolism. To avoid your metabolism from getting sluggish and packing on fat it is important to do weight resistant exercises to build muscle. Arthur, your reply sounds like those scam emails sent to me almost daily, and the scam ads I see often on the internet. You say to "eat fat burning foods" but don't inform us WHICH foods allegedly burn fat, or in what amount and "proper time." What good is that "secret" to the readers here if you don't provide ALL the info? You also say to "add fat boosters to your diet" but don't inform us WHAT those fat boosters are. Your "secrets" are more of the same NON-information I see all over the internet, except that they entice the consumer to pay money to get the full info. thanks for shared this information with us.diet is good way of weight loss.its really work for weight loss. Drinking more water helps the body reduce fat deposits. The kidneys do not function correctly without enough water intake.